Some years ago I read the back of the napkin, and I apply some of the tips from that book. This week, I reached the web page of Eva-Lotta Lamm, and this nice video about sketching (that I want to remind). In the era of Big-data, we consume opinions, isn’t it ironic? Before there were “serious” press and tabloids, now I don’t know how to find the difference, they all seem to be tabloids. Almost everything on newspapers are opinions and there is little “data”. Today is the international day of the press without borders and to celebrate Reporters Without Borders is enabling access to certain websites in countries where they are inaccessible; I think is a nice initiative by the way. But next year I want to propose they will launch a campaign to recover “the verified data”, at least in the Spanish press. Another idea that comes to my mind is that press could notify in a given news the percentage of data and the percentage of opinion. 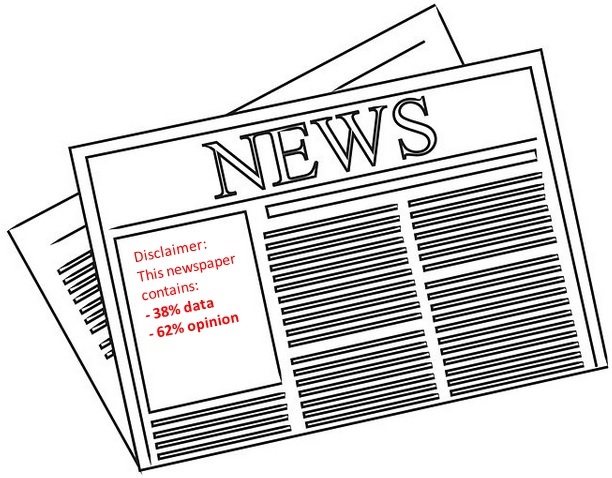 In the same way than the food describes the % of ingredients and add the % daily recommended amount, I would like to see when I read a newspaper the percentage “data” and the percentage of “opinion” in a given news. Imagine!, in this way I can know if my quota of daily tabloids reading is covered. Give me the data, and I will build my own opinion! Imagine a bank that offers you a saving money application linked to your account, with different methods as kakebo, denying you to buy something if you surpassed the limit. They can organize that information, analyze it, build risk assessments on the market, sell the data… Whatever! Banks should start to compete in the digital arena more aggressively to avoid others to take their business. They should take seriously what is going to happen in 5 – 10 years. Orthographic errors are more and more usual. I see them everywhere, specially in social places (Facebook, twitter, Whats-app…). If you add that the person is using the mobile phone, then, the orthographic fault is certainly common. You can activate on certain applications of your son, for instance whats-app. There is an enable / disable code to avoid this is disabled by the kid. If the user writes in the right way, the application gives bonuses to the behavior: reward in terms of time (10 seconds). If the user writes with faults, there is a penalty to the user. Once the user commits 5 faults, the application (in this example: Whats-app) is blocked for 5 minutes, minus the bonuses you accumulated (for instance 5 minutes – 2 bonuses of 10 seconds = 4 minutes and 40 seconds). To reinforce knowledge, during the penalty time, the user can play to a simple quiz, that gives rewards of 3 seconds. After the blockage, you can continue using the application. Probably this application or a similar one exist!!!! Five successful business people in the same room with a video camera, entrepreneurs with their projects come in and face the challenge to convince with its project and get a deal with some of them. Exposure, this is the first thought that came to my mind the first time I watched this show. You take your personal project and your credibility and you put there in front of these guys who play to try dismantle your small sand castle. This is not enough, in the country of the merchandising combined with the new era media consumption, tonnes of content is being created, ways to meet a “shark”, etc. Everything to capitalize the value of their core business.There are a lot of intelligence behind the business tips and directions proposed by these guys, offered for free on the TV, Podcasts, videos…. My imagination takes me to theimmediate idea: why do not to do a similar show with project management?. I now “sequels were never good”. Anyway, imagine five successful project managers evaluating a set of projects every… two weeks?, reviewing major advances, issues, decisions, metrics (behind the schedule, EAC…), challenging to the PM to make decisions and evaluating as a Delivery Assurance on TV. Ideas that changes the market, such as accessibility, functionality, price, style, whatever that makes the market to change. Learn from history is key to understand the importance of innovation, Toynbee’s theories about civilizations describes how civilizations prosper when they effectively motivate their population to creatively contribute to society. When creative capacity dissipates the civilization begins its descents. Imagine you are the HR lead for a big organization. You know Linkedin is the more used professional network used by the employees. This network manages candidates appliances for other companies (mainly your competitors). is there market for that information? is it licit to sell that information? how much valuable is it? what could be the price of it? 2011 is finishing. It’s the first time in 7 years that I stay in the same position during 2 years. It has been important to be here for 2 years, this last one is very challenging and I required time to achieve it well. 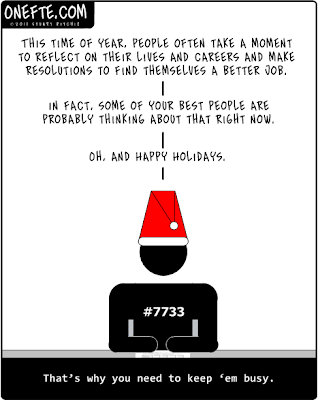 New challenges are coming, I have to think about them during Christmas vacations. As usual, so many doubts, so many questions, so many things in my mind. This challenge is not just a job change, it goes with personal changes and this add complexity to the decision. What is a software solution? It’s a capability you can execute; you can identify on it processes, data, automation, technologies, methodologies and organizational structures. Are you more lost than an entry that is shown in the position #246 in google? If you are there, from my honest oppinion, you are an anonymous person in this great world, and the words you write are not identified as useful by a search engine.